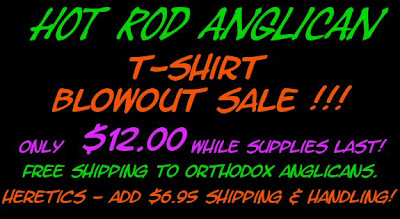 Hot Rod Anglican T-Shirt Blowout Sale !!! To welcome all my new readers, who may have wandered over from StandFirm or MCJ ... I am holding a special "Buy it While There's Still Such a Thing as Anglicanism" T-shirt sale! And here is the lovely Tracy, modeling one of these fine shirts!